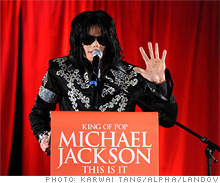 Michael Jackson's tour might have bagged $400 million. His death leaves a host of questions, possibly messy fights and the prospect of renewed interest in the star's music. Michael Jackson's story, in the end, is the ultimate Hollywood comeback that was never to be. LOS ANGELES (Fortune) -- -- One of the executives whose hapless job it was to determine whether Michael Jackson really had it in him to mount a 50-show concert gig in London slated to begin next month told me a few weeks ago that Jackson was surprisingly robust. What was clear, the executive recalled, was that Jackson was motivated not just by financial gain or rehabilitating his career -- though he had dug himself quite a hole in both areas over the years. More than that, Jackson was doing it for his three young kids and his wish for them to see him back on top of his game -- more "King of Pop" than the "Wacko Jacko" the tabloids had branded him (with considerable justification). Buz Kohan, a producer, longtime friend and collaborator of Jackson's -- he wrote the lyrics to the now sadly apt ballad "Gone Too Soon" -- was planning to attend a full rehearsal of the show at Los Angeles' Staples Center this weekend. "He was very enthused and his energy level was high as well as his optimism," said Kohan. "Not that it was a last hurrah -- but it was like a reawakening." Another executive who had dealings with Jackson over the years recalled hearing of his being rushed to hospital in Los Angeles on Thursday: "The first thing everybody thought was 'here he goes again,' " this person said. "Three weeks before a TV show or concert he gets sick to get out of things." Very quickly, of course, it became clear that Jackson, 50, had suffered apparent cardiac arrest, and he was pronounced dead after being rushed to UCLA Medical Center. It was all over except for the speculation about his final days, the tributes, and the messes that Jackson's untimely death has left behind. Jackson's was a life and career of staggering talent and towering weirdness, and perhaps the ultimate cautionary tale of the perils of child stardom. We'll leave most of the saga for others to parse, but marvel instead at how Jackson is now something more: the ultimate story of the Hollywood comeback that was never to be -- at least not the way it was planned. In business, as in life, Jackson did nothing in small measure. When tickets for Jackson's 50-date comeback concert series went on sale in March, some 750,000 tickets sold out in five hours. The shows had been arranged by AEG Live Entertainment, an arm of former telecom billionaire Phil Anschultz's private empire, which also owns 02, the large London arena where the shows were scheduled to take place over several months. Swarovski, the crystal-maker, had prepared a new suit for Jackson to perform in encompassing 300,000 crystal elements that is reportedly worth 1 million pounds. Jackson's comeback was to include a concert DVD, video game, and the release of the singer's first new singles in years. And the London dates were just the beginning of a tour that, if it all panned, out, might have earned Jackson more than $400 million and even spawned a "Thriller" casino in Macau -- the name coming from his 1982 album that remains the best-seller of all time. There's no question Jackson needed the money, having dug himself into a hole of close to $500 million in debts over the years by living beyond even his own outsized fantasyland means and fending off a seemingly endless stream of litigation. He also certainly had assets -- mostly notably his own music royalties plus his stake from a music publishing library with more than 200 Beatles songs that he had shrewdly purchased in 1985. But after various financial reorganizations aimed at staving off creditors, Jackson today owns 25% of the library -- the remainder is held by Sony Music -- and it is held in a trust designed to shield it from future claims against his estate. Jackson only released one album in the past decade --it didn't sell well -- and his last few years were marked by controversy and strange dealings. Colony Capital's CEO, Thomas Barrack Jr., has done billions of dollars of real estate deals that are often much larger than his firm's bet on Neverland -- for which Jackson was given a piece of the note on the property. But the purchase was part of a bigger mission by Barrack to rehabilitate Jackson's career, and in turn (and in theory) boost the market value of Neverland. According to the Los Angeles Times, it was Barrack who called his friend Anschultz to pitch the idea of Jackson's comeback concert series. After all, AEG was behind other megastar shows like Celine Dion's concert run in Las Vegas. In all, AEG has reportedly invested more than $30 million in Jackson's comeback that will never be. Judging by the throngs holding vigils for Jackson, Neverland still has obvious potential to pay off as a kind of Graceland (i.e., a museum for Jackson devotees) if Barrack decides to go that route. And speaking of Graceland, it's also the case that Elvis Presley sold more records in the six months following his death in 1977 than he had over the previous decade. And, yes, Presley's daughter was married to Jackson briefly wasn't she? Anyway, people will speculate for years about whether Jackson's London concerts would have worked or even happened had he lived. One person close to Jackson said that he did a full rehearsal of the show on Wednesday night, but wasn't feeling well when he got home. AEG is just the latest -- and last -- Jackson business partner to be left with something of a mess to sort out. But there is an unmistakable irony in this tragedy: In death, Jackson's long-awaited comeback looks to already be well underway. -- An earlier version of this story said that Michael Jackson paid $22 million to settle a civil lawsuit brought by the parents of a 13-year-old boy who had accused Jackson of molesting him and that he had been acquitted of those charges in a criminal trial. A corrected version is above.